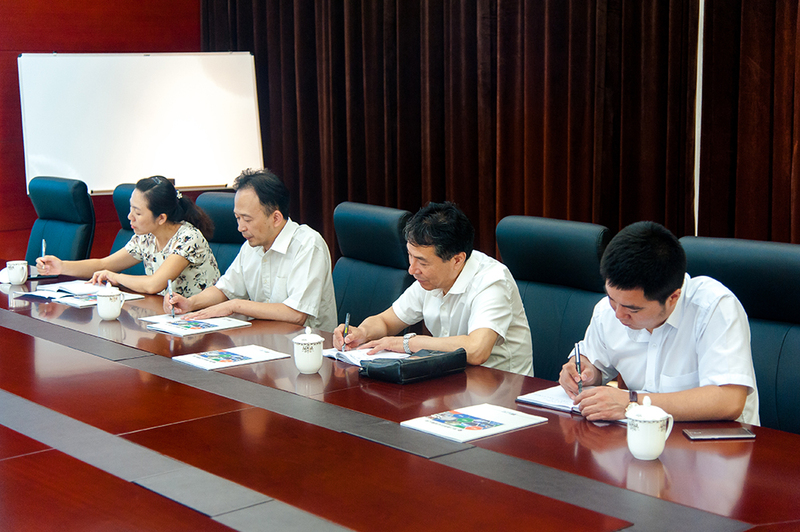 On the afternoon of July 11th, the delegation headed by Zeng Yong, Deputy Secretary General of the Standing Committee of the Yingkou Municipal People's Congress, and Sun Tao, the director of the Work Committee of the Municipal People's Congress Industrial Park, visited Yingkou Kanghui Petrochemical Co., Ltd. In the meeting room of the company, the Municipal People's Congress has led a detailed inquiry on the current production and operation status of Kanghui Petrochemical and the future industrial development plan. Kanghui Petrochemical's development concept of creating an innovative and saving type high-tech enterprise won the unanimous admiration of the leadership of the Municipal People's Congress. During the period, the leaders of the Municipal People's Congress had a detailed understanding of the actual difficulties and problems encountered in the process of the development of the company. Deputy Secretary General Zeng Yong pointed that as the key investment project in Yingkou, Kanghui Petrochemical has been deeply concerned by the leadership of the municipal Party committee. The government will actively solve the difficulties and provide a favorable business environment for the enterprise. It is believed that Kanghui Petrochemical will be stronger and stronger in the future to promote the healthy development of the Yingkou District Park and provide greater help in improving the quality and effectiveness of the overall competitiveness of the region.